As soon as I saw this hotel online I was hopelessly in love. Rated highly by every magazine from Condé Nast to Marie Claire it is one of those dream hideouts that is still affordable (and I hope that doesn't change). Facilities are sparse; a small but deep pool, long piers and moorings for visitors arriving by boat, incredibly comfortable Adirondack chairs, a barbecue where you can cook your own fish, a few kayaks if you fancy a slow float, and most importantly for me, several hammocks. 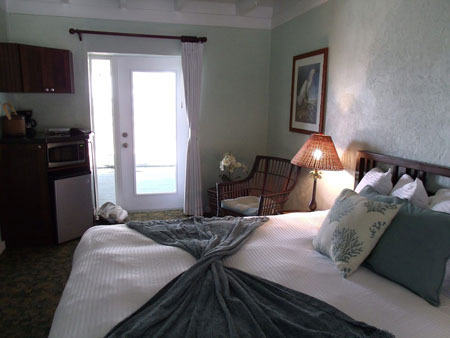 As soon as you arrive here you are in the heart of the Keys, and even if you spend every minute of your stay in the hammock you will not be missing out (apart from on the food and drink – they won't deliver to the hammock!) A few minutes (or it could have been hours – it's hard to tell) after I lay down here I heard a loud splashing from the water; a shoal of fish leaping across the water – purely for my entertainment. There are two ways to explore; either run around and try to find everything or stay in one place and wait for it to come to you. After running for so long I was more than happy to lay back and let life wash over me. I was upgraded to a room that had its own screened porch, with another couple of those super comfortable chairs and room to hang a couple of wet bikinis. Approaching it from the screen side it didn't look like much, and then I saw the appeal, inside the screen you can see the whole view. The room itself was small, but with cute touches like cushions which matched my outfit, coral ornaments and the receptionist also hand delivered a huge jug of ice water. Add a wooden ceiling and a circular ceiling fan (as well as air conditioning – we are not barbarians) and this was the Florida Keys hangout of my dreams. The bathroom was small and had conditioning shampoo (I am so not a fan of this that I carried on using the separate conditioner that I'd brought from previous hotels) and wonderful smelling soap. Unfortunately there was no hot water in the sink, but it was not something I got hung up about as the shower was excellent. It's wonderful. The garden has plenty of space to avoid other guests, and I spent almost as much time in the hammock as I did in my own bed, the first day finally reading my beach book, the next, recovering from seasickness and the last morning, waking up early and lying in the light of the moon as it dropped below the horizon. This is very much a couples place, and it's quite relaxed, but it's big enough that no one should have to feel uncomfortable if a couple are having a romantic moment, someone is having a smoke by the water, or someone is sitting on their balcony finishing a work call – there's enough space for everyone. I also particularly loved the one chair that has been placed on a very small gap in the hedge, giving a great solitary seat to watch the sunset. Breakfast was included and is laid out under the chickee – a traditional Miccosukee house, unfortunately again the breakfast is not really substantial enough for one of my adventure days. I did not enjoy the coffee, but there was fresh sliced cake which was heavenly, as well as prepackaged muffins, snack bars and fruit juice. My room had its own coffee maker (but no supplies) and fridge and luckily enough I had asked for a little pot of milk with my take out Key Lime Pie on my first night, so the next day (after I had recovered from the seasickness) I was able to make tea in my room with fresh milk and enjoy my pie sitting in Key Largo. Heaven. Next time I would bring my own coffee and supplies, as it is a pain to have to leave the hotel at all. You'll notice I don't go on too much about the beds in my Florida Escape – because unlike other places I've visited all were fabulous, but they do seem to get softer the further south you go. N.B. Now this is unsubstantiated but I did hear a rumour that there was a saltwater crocodile around this are, so do check with the hotel before you head out for a swim or kayak - just to be on the safe side!